Photo Courtesy Village of Westmont. Decorating Day is Nov. 22. The annual Holly Days Winter Festival is a cooperative effort between the Village of Westmont, Westmont Historical Society, Westmont Park District, Westmont Special Events Corporation and Westmont Chamber of Commerce & Tourism Bureau. Each year, events begin the week of Thanksgiving and conclude on New Year’s Eve. The unofficial start of Westmont’s Holly Days Winter Festival each year is Decorating Day on Sun., Nov. 22. The trees in Veterans Memorial Park come to life as sponsors and decorating groups add their personal touch to their tree. Inside the Park District Administrative Building, the Lions Club will be busy serving up the best pancake breakfast in town. Photo Courtesy Village of Westmont. 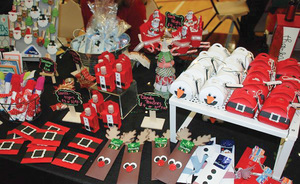 Get a head start on your shopping at the Holly Days Gift Bazaar. Our annual Holly Days Gift Bazaar is held in the Community Center gym and is full of one-of-a-kind gifts for your loved ones. The Twin Lakes Learning Center is also there with a huge bake sale; you’ll want to shop early to get the very best treats and sweets! Also on Decorating Day, the People’s Resource Center will be on site to accept donations for the food pantry. If you are decorating or shopping, please bring a non-perishable food item to donate. We invite you, your friends and family members to be part of the very best way to start the holiday season. For more information, visit westmontparks.org or call 630-963-5252. 8am–1pm Lions Club Pancake Breakfast—$5 kids & seniors; 7 adults; kids 5 & under are free!